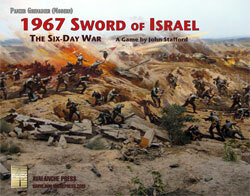 1967: Sword of Israel presents all three fronts of the Six Day Way: the West Bank, Golan Heights and the Sinai. Research materials on this war are fairly scarce. The Israelis are remarkably tight-lipped about their tactics and weapons, presumably for security purposes (and the high likelihood they’ll fight over the same ground again in the future). The Arabs would just as soon forget the 1967 clash ever occurred. Nevertheless, there are some books out there, and I particularly found Eric Hammel’s Six Days in June and the two recent Osprey Campaign titles on the war to be very helpful. Of course, any errors in interpretation of maps and combat capabilities are mine. This was certainly a modern war. Combined arms tactics, integrated airpower and artillery, rapid advances, and employment of some very new weapons all played a role. While helicopters were present in the Israeli Air Force, at this time they only performed the air ambulance, spotting, and transport roles, and so did not factor into any of the scenarios as designed. They did provide transport for the paratroopers who attacked at Umm Katef, but the landing area was outside Egyptian visual range and so played no part in the battle. Similarly, toward the end of the Golan operation, helicopters were again used to hop infantry over the hills to assault and capture new Syrian positions, but the positions were empty and there was no fight. Because of the large variation in the terrain fought over, and having 50 scenarios represented, slimming the board selection down to just eight boards was very difficult. I was forced to make some compromises in the boards that I hope don’t change the battle too much from its original; after all, I’m trying to give you a reasonable facsimile of the ground and forces to simulate the battle. I hope you like the result. The counter mix is fairly varied as well, with five combatant forces supplied by a variety of NATO and Warsaw Pact arsenals. We’ve added more terrain markers than used in most Panzer Grenadier games to help customize some of the boards. We hope you find this useful and playable. I’d like to caution the players that, for the most part, these are not going to be “balanced” scenarios in typical meeting engagements like many other games. The Arab forces really did have problems in this war. They tended to attack in an uncoordinated manner due to poorly trained leaders and troops, compounded by their lack of a true long-term NCO corps. They demonstrated brittle morale, and lost nearly every engagement. I don't see it as "attractive" to play the Arabs, but I could not give them abilities they did not have and call it a historical simulation. So, what I've tried to do is make the Victory Conditions so challenging for the Israelis that often the Arabs can win with some skillful play or good luck despite the poor resources they have to employ. Generally, this means the Israeli player won’t have the luxury of using his superior firepower to slowly chew up his numerically advantaged opponent, then sweeping in when they are all destroyed and demoralized to claim the key locations. Instead, he’ll constantly have to assess the risk to the force against the short timeline he has to accomplish his goals. He can lose either way. Conversely, the Arab player must skillfully employ the few advantages he possesses. Make those AT guns count. Set up lots of crossfire shots, especially with your T-55s which should do well against the Israelis, even the Centurions. Use hidden troops to full advantage for fire as well as late-game movement to steal objectives. And be careful with your leaders, as they are few, and critical to maintaining the mobility of your forces. 1967: Sword of Israel and the Panzer Grenadier (Modern) rules evolved in parallel over a two year period. Some of the rule changes from Panzer Grenadier admittedly address petty grievances of this author, but mostly they just evolve the “feel” of combat to align with the realities of modern warfare. I’d be glad to hear other ideas about modern warfare concepts, either applying broadly to post-World War Two warfare, or applying to specific campaigns and forces. Good luck commanding your troops; I hope you enjoy the game as much as I enjoyed creating it.